In our society, males are seen as pillars of strength that must not show any sign of weakness. 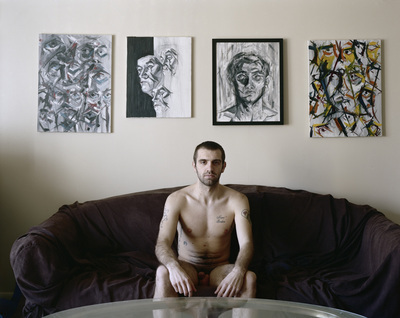 The photographs in Exposed confront this stereotype and show portraits of men that are both revealing and sensitive. Making photographs of young men in private spaces, I attempt to mitigate the barrier that they normally place in front of others. Through these images, the perceived dominance of men in society is shifted. The men in the images are now vulnerable while the viewer has the power. As a black male in America I feel pressured to emulate the strong, unwavering individuals portrayed in popular culture. Despite the role models on TV, I have always felt self-conscious about my body and how others see it. I understand the reluctance to expose one's body and seek to explore that through my photographs.